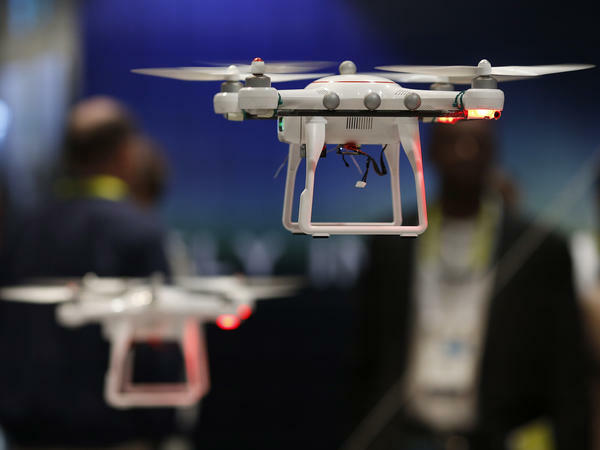 Drones fly at the International CES held last month in Las Vegas. In Oklahoma, a state senator has introduced a bill that would allow land-owners to shoot a drone down if it's above their property. A bill that would let property owners shoot down a drone that's over their land has made its way out of a Senate committee in Oklahoma, setting up a potential vote on the matter. It's unclear whether the legislation has a chance of passage; we're reporting on it here as another facet of the debate over how drones are integrated (and regulated) in modern society. The bill, SB 492, provides "civil immunity for damage or destruction of a drone on personal property." It was introduced recently by Sen. Ralph Shortey; the Oklahoma Senate Judiciary Committee approved it Tuesday by a 6-4 vote. "Shortey says he's received reports of people shooting down drones, but acknowledged he's unaware of anyone being sued for doing so. "He says landowners have no way of knowing the intention of a drone's owner, and shouldn't be held liable for shooting one down."